Festive Old Town comes alive at this new shopping and dining attraction in historic Old Town. Shop at the Beacon Artworks Gallery (619-823-6130) for colorful San Diego paintings. Sample San Diego’s best tasting wines at the Hacienda De Las Rosas’ tasting room (619-840-5579). Dine on the spacious patio at the Casa de Reyes Mexican Restaurant, or at their Barra Barra Saloon with its comfortable and inviting patio and indoor dining rooms. 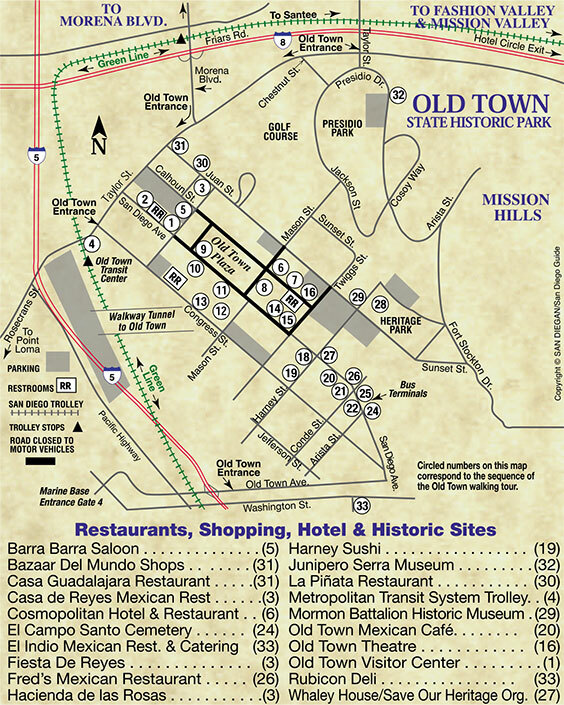 A great place to begin your walking tour of Fiesta de Reyes is at the Temecula Olive Oil Company (A) (619-293-7515), which is located on the left hand side when you enter the courtyard via the Old Town Plaza entrance. The tasting room offers complementary sampling of their 24 flavorful olive oils and vinegars. Their basil and garlic infused varieties are absolutely delicious. After your tasting, why not purchase a bottle of olive oil from their retail shop. Next door to the Temecula Olive Oil Company is the Beacon Artworks Gallery (B) (619-823-6130). On hand to greet you is the personable artist himself, RD Riccoboni. He specializes in colorful paintings of landmarks in Old Town. They make wonderful souvenirs! Credit cards: DISC, MC, VISA. Continuing along the plaza is Hot Licks (C) (619-293-3111), which also bills itself as the “casa de fuego” which means “house of fire” in Spanish. Hot Licks sells the best selection of the hottest-of-the-hot salsas, sauces, and mustards west of the Mississippi River. Customers are encouraged to sample hot sauces before they buy, but some merchandise is so blazingly hot that signing a waiver is required before sampling it. Top sellers include Hot Licks Suicide Sauce and Ultimate Insanity Sauce. Also on sale are unique gift items like red chili lights. Credit cards: AE, MC, VISA. For the best in Mexican crafts and turquoise jewelry, step into the Pasaje Del Sol (D) (619-294-3159). Their collection of sterling silver necklaces and earrings is especially remarkable. Here you’ll find one-of-a-kind jewels that will get you lots of compliments! DISC, MC, VISA. Bailey & McGuire (E) (619-295-0306) is well-known for its top notch selection of pottery from local potters. You can also purchase the festive “papel picado” flags similar to those that decorate the Fiesta de Reyes plaza. Credit cards: AE, DISC, MC, VISA. For the best in Mexican ceramic tile, The Tile Shop (F) (619-297-0293) is the place for you. They also carry personalized street number tiles. Mix-and-match tiles to create the perfect souvenir for your home. You’ll love this place! Credit cards: AE, DISC, MC, VISA. Fiesta Cocina (G) (619-252-8282), which means “party kitchen” in Spanish, is the place to shop for one-of-a-kind kitchen wares. Food lovers flock here for their collection of hand-painted wooden dishware from Mexico, which is beautifully displayed in their gallery at the rear of the store. Each piece is painted in vibrant motifs and signed by each artist. Take a break from shopping by stopping at Viva el Café Espresso and Dessert Bar (I) (619-299-2230) for an espresso boost. This café has a distinctive southwestern twist to your standard Starbucks. Relax in a rawhide chair while sipping their popular Aztec Warrior, a blend of espresso and spiced Mexican chocolate. In the dessert case you’ll be tempted by the assortment of red velvet cupcakes and their spiced Viva Brownie. Credit cards: AE, DISC, MC, VISA. If you’re not a coffee drinker, visit Old Town’s only winery Hacienda de las Rosas (J) (619-840-5579). Their tasting room is the perfect place to enjoy fine local wines. They offer five tastes for ($9.50) and you get to keep the glass. Also ask about joining their wine club. Credit cards: AE, DISC, MC, VISA. The Urban Seed (K) (619-584-7768), located diagonally from Hacienda de las Rosas, is a home and garden specialty store offering luxury goods in a garden setting. Browse their fine collection of French milled soaps, glass lamps, and wildflower seeds under a canopy of twinkling lights. Credit cards: MC, VISA. Continue on to del Cobre (L) (619-450-6704) for fine handmade Mexican copperware. From teakettles to picture frames, del Cobre has a wide selection of giftware all cast in brilliant copper! Credit cards: AE, DISC, MC, VISA. For eye-catching Mexican folk art visit Tienda de Reyes (M) (619-491-0611). Especially impressive is their assortment of Dia de los Muertos (Day of the Dead) skeleton figurines and “shrine” boxes. Here too you’ll find bead curtains, matchboxes, and more all bearing the image of Mexican artist Frida Kahlo. Credit cards: AE, DISC, MC, VISA. For a quick bite, stop at the Street Taco Vendor (N) located next to Tienda de Reyes. You can pick up two “street” style tacos for ($4). Another shop on your walking tour is Geppetto’s, A Child’s Fantasy (O) (619-293-7520) featuring an impressive collection of games, toys and dolls. Geppetto’s has eight locations in San Diego County. They will even gift wrap your purchase for free! Credit cards: AE, DISC, MC, VISA. Next door to Geppetto’s is the La Panaderia Bakery (P) (619-294-5709). Everyday the bakers at La Panaderia make their fried Mexican pastries, similar to American donuts, on site. They are delicious! Cash only. Next door to the south in the corner is Silver Lily (Y), which offers a wide selection of beautiful, high-quality, unique artisan-crafted jewelry, including one-of-a-kind pieces in silver and semi-precious stones. Visit Silver Lily, where old world Mexican and modern unite. Just next door with an entrance from Silver Lily and facing the Old Town Plaza is a real show-stopper and a fabulous addition to the fine selection of stores at Fiesta de Reyes. It is the Old Town House of Jerky and Root Beer (Z). It could well be the most popular shop, if not, it is undoubtedly the busiest one. It is hard to say which is more popular the root beers or the beef jerky, because both are real crowd pleasers. As for the root beer, they offer up to 30 unusual brands of hard-to-find root beer, sarsaparillas and old style sodas, which can be purchased ice cold. No less appealing is their wide array of unusual beef jerky, which you can sample before your buy. Of course they have great standards like beef and turkey jerky, but it’s their unusual ones like buffalo, venison, wild boar, alligator and even kangaroo that gets everyone’s attention. Finally at the southern entrance to Fiesta de Reyes, which was the starting point of our tour of Fiesta de Reyes is Old Town Roasted Nuts (R). This outdoor stand offers cinnamon-glazed roasted almonds, cashews, peanuts, walnuts, and more! Ice cold water, soda, juice, lemonade, and iced tea are also available, as well as gift platters, mixed bags, and specials. Their FREE samples are hard to resist. There is no doubt about it, the sweet aroma of roasted sugar and cinnamon that fills the air is too great an offer to pass up! And if your are having a party soon, their gift platters filled with mixed nuts will make a big hit to your event. While this concludes the shopping walking tour of festive Fiesta de Reyes, it is only the beginning of the festivities surrounding this open air plaza. Diners will be delighted with the wide array of dining selections. A great reason for visiting the Fiesta de Reyes is dining at their excellent restaurants. So whatever you do, don’t miss the opportunity to experience their two amazing restaurants, which are Casa de Reyes Restaurant (H) and the Barra Barra Saloon (S). Both restaurants are open daily 10 a.m.–10 p.m. They both accept AE, DISC, MC, VISA. Casa de Reyes Restaurant (H) (619-220-5040) is a real treat when dining in Old Town’s State Historic Park. The best way to get to the Casa de Reyes Restaurant is to enter via the south entrance. Located in the center of the courtyard, you can drink one of their famous frosty margaritas while dining under the stars. The atmosphere is warm and festive and the food is delicious. Feast on flavorful Mexican cuisine like chili relleno and sizzling fajitas, and be sure to try one of their legendary house margaritas. An added plus is that they also feature live Mexican music while you dine. Located just outside the Fiesta de Reyes southern entrance is the Barra Barra Saloon (S)(619-291-3200). The patio overlooking Old Town Plaza is the perfect place to enjoy the historical ambiance with a fabulous meal and a frosty margarita. They also offer indoor dining in their two southwestern inspired dining rooms. Entrees of special note include the Chicken Mole Oaxaca topped with pablano mole sauce. Another winner is their fajita platter with your choice of chicken, beef or shrimp. Be sure to take advantage of Barra Barra’s many food and drink specials offered throughout the week. On Mondays kids eat free with a paying adult. Come back on Friday and Saturday nights for ($1) tacos 10 p.m.–12 a.m. Happy Hour is Mon.–Fri. 4 p.m.–7 p.m. with the legendary “Best Margarita in San Diego…Only Five Bucks!” It’s served in a tall glass and is sure to grab your attention! The Fiesta de Reyes is also the best place to enjoy daily live entertainment for the whole family on their outdoor stage in the central plaza. Enjoy Mexican folklorico dancing Mon. 5:30 p.m.–8:30 p.m., Sat. 12 p.m.–3 p.m., and Sun. 11 a.m.–2 p.m. Also, listen to live mariachi music every Thurs., Fri., and Sat. nights. Shops, restaurants and live Mexican music make Fiesta de Reyes an unforgettable destination. So bring your friends, family and out-of-town guests to this must-see San Diego attraction. A trip to Fiesta de Reyes would not be complete without a visit to Old Town’s only wine tasting room Hacienda de las Rosas (J) (619-840-5579). Their tasting room is the perfect place to enjoy fine local wines. They offer five tastes for ($9.50) and you get to keep the glass. Also ask about joining their free wine club for tastings and special offers on bottles. Credit cards: AE, DISC, MC, VISA. For a quick bite, stop at the Street Taco Vendor (N) located next to Tienda de Reyes. You can pick up two “street” style tacos for ($4). Also, the festive La Panaderia Bakery (P) (619-294-5709) is a great place to pick up a delicious treat. Everyday the bakers at La Panaderia make their fried Mexican pastries, similar to American donuts, on site. Cash only. If you need an espresso boost, stop into Viva el Café Espresso and Dessert Bar (I) (619-299-2230). This café has a distinctive southwestern twist to your standard Starbucks. Relax in a rawhide chair while sipping their popular Aztec Warrior, a blend of espresso and spiced Mexican chocolate. In the dessert case you’ll be tempted by the assortment of red velvet cupcakes and their spiced Viva Brownie. Credit cards: AE, DISC, MC, VISA. Urban Seed, Beacon Artworks Gallery, and Tienda de Reyes Spotlight from Sorrento Productions on Vimeo.